The introduction of new production processes can have dramatic effects on aggregate productivity within an industry. 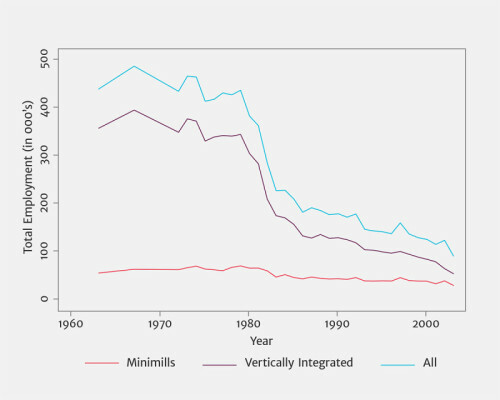 This research explores the impact of the major technological innovation of the minimill on the US steel industry, analyzing detailed producer-level data on prices and production over a 40-year period. 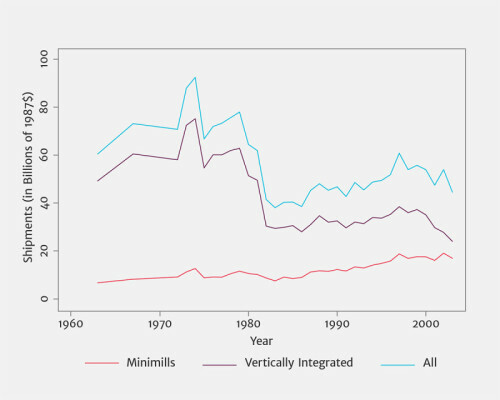 The study illustrates how technology can drive reallocation: the market share of plants using minimills rose significantly, but the older technology of vertically integrated production was not entirely displaced. Instead, less productive vertically integrated plants were driven out of the industry and output was reallocated to more efficient producers. 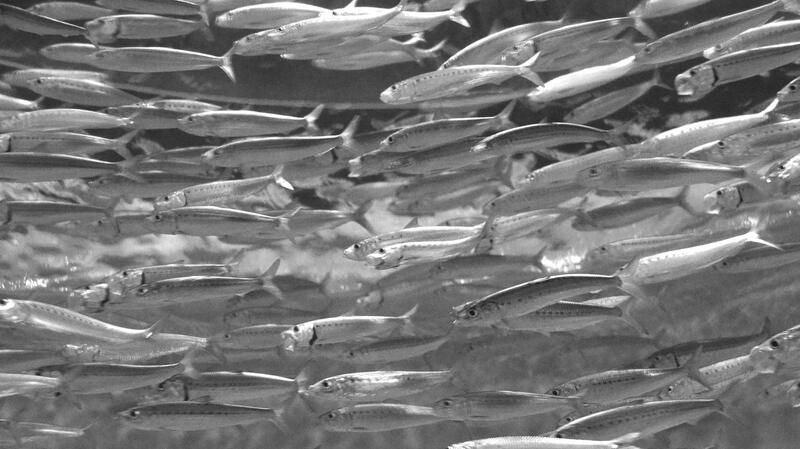 The increased availability of detailed data on what goes on inside firms has made it possible for researchers analyzing the drivers of productivity to distinguish between effects within producers and across producers. The empirical results of these studies point to an important distinction between productivity effects at the level of the individual producer and those realized by moving resources between producers – the reallocation mechanism. Industry productivity rises not only because the average plant becomes more productive, but due to a shift of resources from less productive plants to more productive plants. The latter effects are governed by market forces such as competition, whereby market shares are allocated across producers active in a given market. Indeed, industry productivity rises not only because the average plant becomes more productive, but due to a shift of resources from less productive plants to more productive plants. In recent research, we examine one particular industry – the US steel sector – for which we have detailed producer-level data on prices and production. Our setting is well suited for measuring the role of technological change, since we directly observe the arrival of a new production process – the minimill – at the plant level. As such, this constitutes a case study of the impact of a major technological innovation that changed the face of an industry. The steel industry not only had a major impact on the geography of economic activity, but it also significantly increased the efficiency of production. 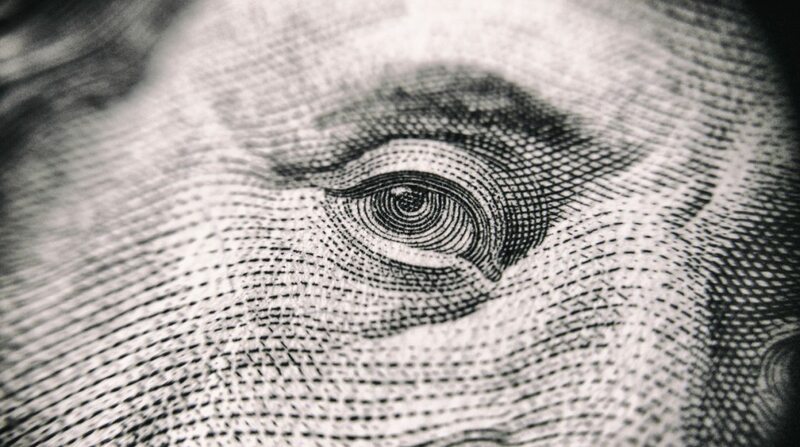 As a consequence, prices and overall profits in the industry were considerably lower. Both the inputs used in steelmaking and the products were remarkably stable over a 40-year period. Productivity growth in steel is almost uniquely driven by process innovation rather than through the introduction of new goods. Observing a panel of steel producers over a 40-year period – 1963-2002 – allows us to study the long-run implications of increased competition, such as the slow process of firm entry and exit. 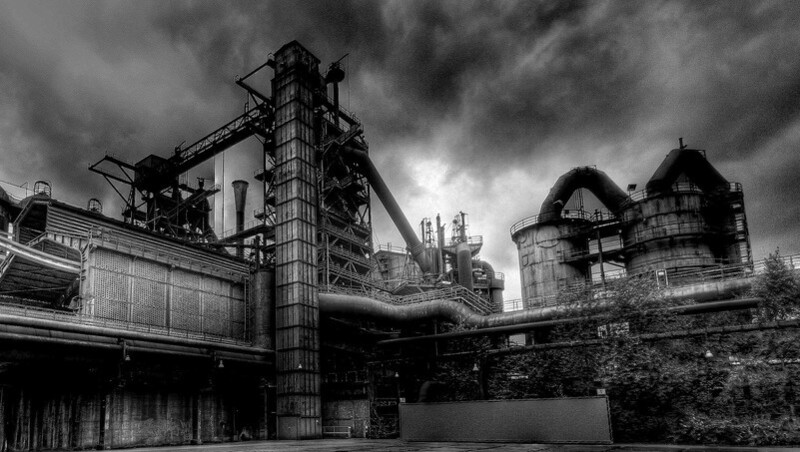 The US steel industry shed about 75% of its workforce between 1962 and 2005: about 400,000 employees. This dramatic fall in employment had far-reaching economic and social implications. For example, between 1950 and 2000, Pittsburgh – which used to be the center of the US steel industry – fell from being the 10th largest city in the United States to the 52nd largest. While employment in the steel sector fell by a factor of five, shipments of steel products in 2005 reached the level of the early 1960s. Thus, output per worker grew by a factor of five, while total factor productivity increased by 38%. This makes the steel sector one of the fastest growing manufacturing industries over the last three decades, behind only the computer software and equipment industries. The US steel industry really stands out: over the period 1972-2002, it witnessed impressive productivity growth – 28% compared with the median of 3% – and this while the sector contracted by 35%. The starkest difference was the drop in employment of 80% compared with a decline of 5% for the average sector. This left the industry with only 100,000 workers in 2002 compared with about 500,000 in 1972. Figure 1 plots the trajectory of shipments, employment and capital over our sample period. 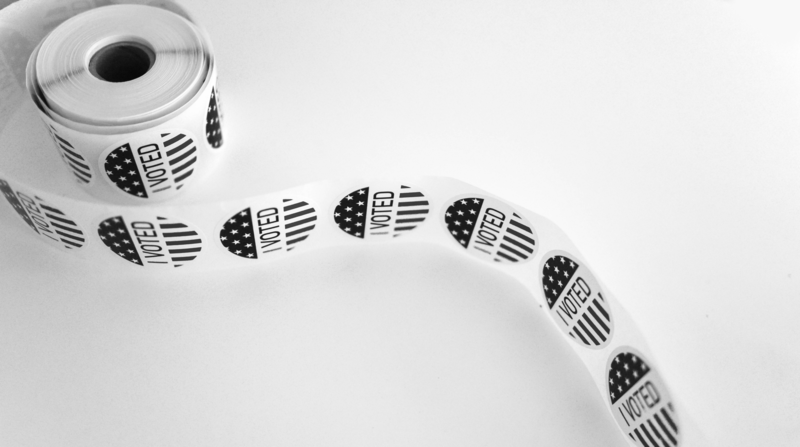 The black solid line tracks the relevant variable for the industry at large. We find that the main reason for the rapid productivity growth – and the associated decline in employment – was not the result of a steady drop in steel consumption or the emergence of globalization. Nor was it the displacement of production away from the Midwest. The increase in productivity in the US steel industry can be directly linked to the introduction of a new production technology: the ‘minimill’. 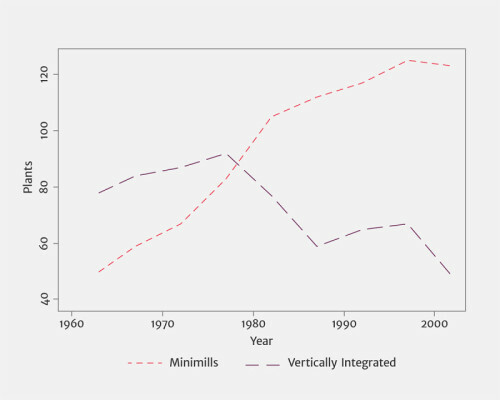 We find that minimill plants were significantly more productive than traditional steel plants, and that this productivity premium initiated a reallocation process whereby minimills displaced the older technology inimill plants were significantly more productive than traditional steel plants, and that this productivity premium initiated a reallocation process whereby minimills displaced the older technology known as vertically integrated production. The reallocation of output was responsible for about a third of the increase in the industry’s total factor productivity. In addition, the productivity of minimills steadily increased. In fact, we can directly attribute almost half of the aggregate productivity growth in steel to the entry of this new technology. Revisiting Figure 1, we report the trajectory of all the relevant variables by technology type: the minimill in red; and vertical integrated production in blue. The first and fourth panels underscore the fact that the contraction in output and employment occurred while the new technology increased its market share, both in terms of output and the number of producers. But the older technology was not entirely displaced. 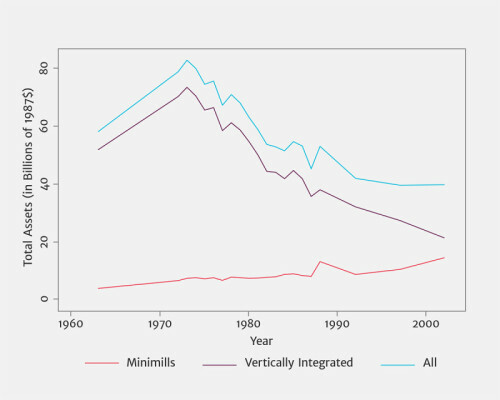 Instead, vertically integrated producers experienced a dramatic resurgence of productivity and, by 2002, were on average as productive as minimills. This resurgence was not driven by improvements at integrated plants. Rather, less productive vertically integrated plants were driven out of the industry, and output was reallocated to more efficient producers. We see the exit of vertically integrated producers in precisely the product segments where they competed head-to-head with minimills. The entry and expansion of minimills was thus responsible for the reallocation process among incumbents. When we evaluate the impact of a drastic technological change on aggregate productivity growth, we control for other potential drivers of productivity growth, including international competition, geography, and firm-level factors such as organization and management. We also show that mark-ups in this industry fell by 50% over the last 40 years, which is not surprising if we look at the output and input price changes in the industry. The joint increase in productivity and reduction in mark-ups led to an increase in consumer surplus of $9-11 billion per year. This column summarizes ‘Reallocation and Technology: Evidence from the US Steel Industry’ by Allan Collard-Wexler and Jan De Loecker, published in the American Economic Review in 2015.